Peter Sourian Senior Lecturer in the Humanities. Prof. Bartscherer also teaches in the Philosophy, Classics, and First Year Seminar programs. He works on the intersection of literature and philosophy in the ancient Greek and modern German traditions, focusing on tragic drama, aesthetics, and performance, and writes on technology, new media, contemporary art, and the philosophy of education. He is co-editor of Switching Codes: Thinking Through Digital Technology in the Humanities and the Arts with Roderick Coover and Erotikon: Essays on Eros Ancient and Modern with Shadi Bartsch, both published by the University of Chicago Press. Bartscherer studied at the University of Pennsylvania (BA) and the University of Chicago (MA, Ph.D.). 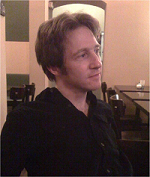 He is a research associate on the Équipe Nietzsche at the Institut des Textes et Manuscrits Modernes (Paris) and is on the advisory board of nietzschesource.org. He has held research fellowships at the École Normale Supérieure, the University of Heidelberg, and the LMU in Munich. He has received fellowships from the DAAD, and the Woodrow Wilson, Nef, and Earhart foundations, and has taught previously at the Art Institute of Chicago and the University of Chicago.